With my Wargaming Tradecraft brand, application is easier than any of the competitors! 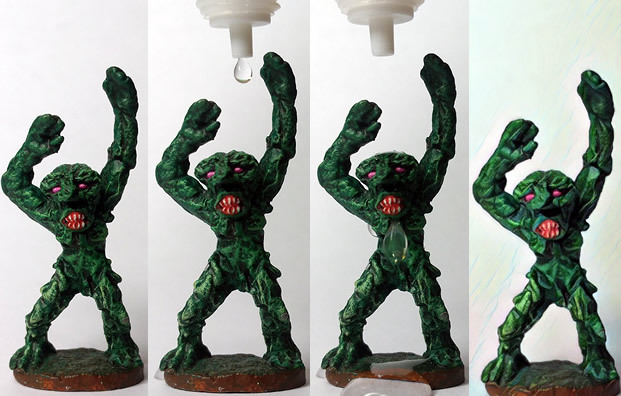 Add a couple drops of Liquid Talent to any miniature. This means that a single bottle of Wargaming Tradecraft Liquid Talent is all you need for any average sized army. You don't need a brush and there's no risk of making a mess with a standard wash pot. Now, depending on how large of an effect you're after, you can apply it multiple times. Notice below, how with one application the effect is subtle but on the right you can see how with only two applications the effect is so much more visible. With the patented formula, the effect is cumulative! 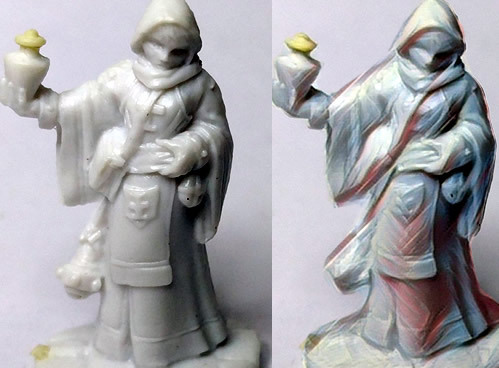 Left: Original miniature, Middle: One Application, Right: Two Applications. This design was intentional to allow most people to create a subtle effect while those who want a more extreme effect don't have to buy too much product. Money saved! That's the Wargaming Tradecraft difference. Below, I want to highlight some of the other differences that Wargaming Tradecraft Liquid Talent can make on your hobby. 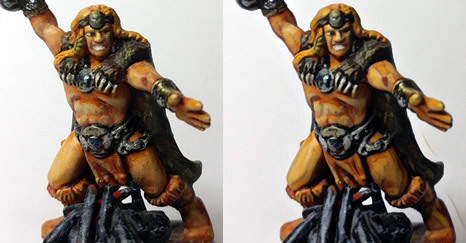 These days, everyone wants that achievable "NMM" paint job. Knowing this, Liquid Talent has been formulated to react with TMM paints (True-Metallic Metals) to automatically convert your work to the NMM ideal. Skin-tones are another difficult thing to paint. Liquid Talent can highlight the natural muscles in both male and female miniatures while still cleaning up roughness left behind by previous attempts to paint, wash and highlight. Wargaming Tradecraft Liquid Talent can also clean up tricky areas like faces - particularly making eyes and mouths look the way they should. 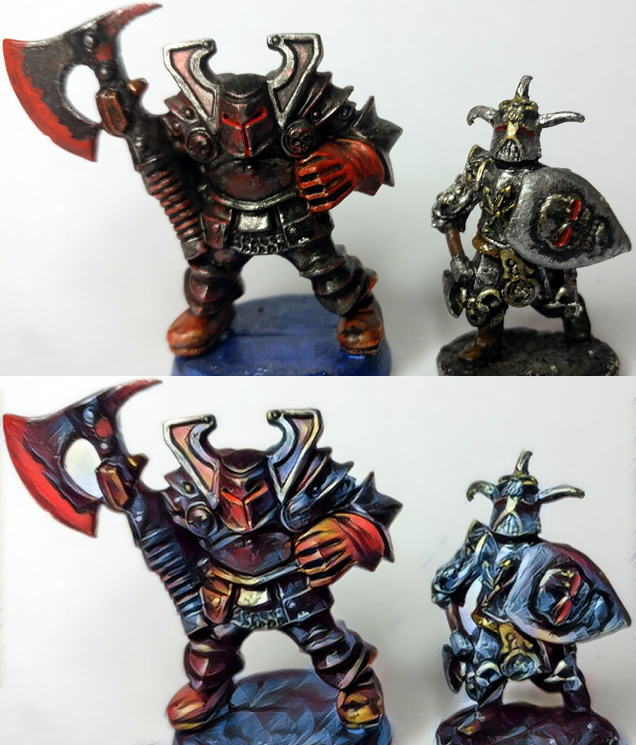 Even for miniatures with non-traditional tones, Liquid Talent can help you out. In the below photo, notice how despite having a range of intense colours (Purple, Green, Orange and metals) it still manages to improve the appearance of the miniature while balancing the effect across the whole figure. 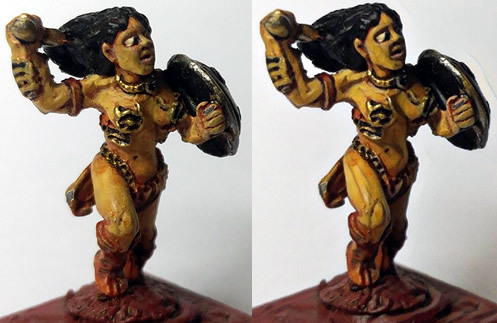 Here at Wargaming Tradecraft, I recognize that not everyone enjoys painting their miniatures. Don't worry, I've got you covered too! The below figure is from Bones and not primed. Liquid Talent still manages to add texture, definition and a little splash of colour allowing you get minis on table with a minimal effort. I hope that I've managed to highlight the reasons you want to purchase Liquid Talent, coming soon to a Favorite Local Gaming Store near you! * Credit where it's due, images created using the Prisma Filter App.